This week I made Sachertorte, a type of Austrian tart made with all the chocolate in the world. ALL the chocolate. Mmmm. It was surprisingly simple as well! It takes time due to waiting for things to cool before you can move on, but there’s not really anything incredibly difficult in the recipe. I used Mary Berry’s recipe (a bit obsessed with her at the moment, she’s amazing) from my shiny new Mary Berry cake book. 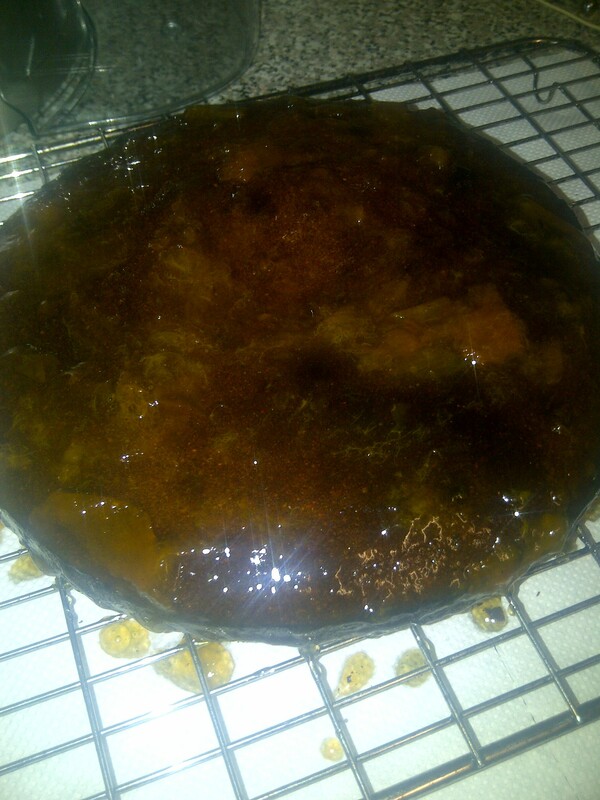 Grease and line a 9 inch (23cm) diameter cake tin with greased greaseproof paper. Melt the plain chocolate slowly in a bowl over a pan of hot water (don’t let the bowl touch the water), then let it cool slightly. Beat the butter until it’s really soft, then beat in the sugar until the mixture is light and fluffy. Pour in the cooled chocolate and vanilla essence and mix it well. Add in the egg yolks one by one, and mix it well after every addition. Then stir in the ground almonds and the flour – the mixture will get pretty thick and not cakey at all, but it’s supposed to be like that! In a separate bowl, whisk the egg whites until they form stiff peaks, then pour about a third of the egg whites into the chocolate mixture and stir it vigorously. Pour the remaining egg whites into the chocolate mixture and fold them in, but stir it as little as possible so as to keep the air in the egg whites – if you mix it too much the cake won’t rise at all (the eggs are the only raising agent in the recipe really – the cake won’t rise loads anyway but if the egg whites get messed up then it will be completely flat!). Pour the mixture into the cake tin and level the surface. Bake in the pre-heated oven for 40-45 mins or until the cake has risen and isn’t wobbly. Take it out and leave it in the tin cooling for a few minutes, then turn it out of the tin and leave it on a wire rack until it’s cooled completely. The Mary Berry recipe doesn’t say to put apricot jam in the middle of the cake, but traditional Sachertorte’s do, and I think mine would have been better with some in the middle, so I increased the amount of apricot jam in the ingredients so that there’s enough to put some in. So, for the apricot topping and filling, cut the cake in half, heat the jam in a pan and then brush some over the middle of the cake. Put the top of the cake back on, and smear the apricot jam over the top and sides of the cake. Leave it to set. For the icing, melt the plain chocolate slowly in a bowl with the double cream, over some hot water. 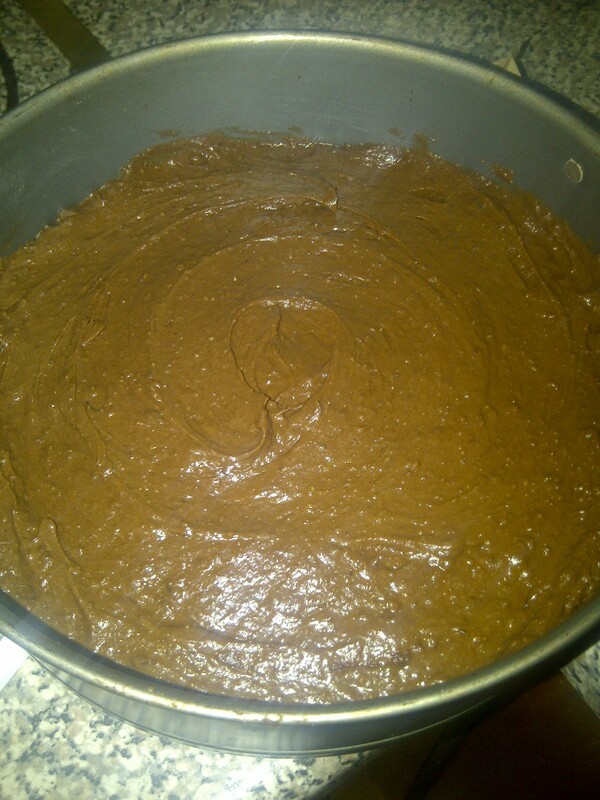 Allow it to cool for a couple of minutes until it’s thickened a bit, then pour it onto the centre of the cake. Spread it carefully over the top and sides – try to keep it as smooth as possible! Then leave it to set i.e. go sit down and eat the leftover ganache. 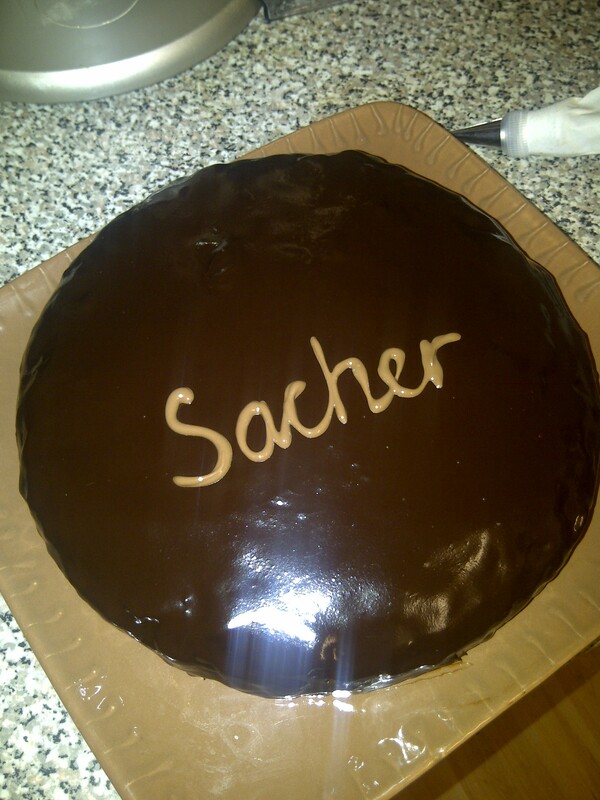 It’s not a Sachertorte without the word ‘Sacher’ written across it. So, melt the milk chocolate in a bowl over hot water, spoon the chocolate into a piping bag (or sandwich bag with a corner chopped off) and pipe the word ‘Sacher’ across it. Leave it to set. It’s tastiest if you leave it in the fridge for a day or two before you eat it, but that takes extreme willpower so nobody will blame you if you can’t wait that long! So if you want to impress your friends with something that sounds fancy and difficult, but really isn’t, then the Sachertorte’s your man! This entry was posted in Cakes and tagged baking, cake, chocolate, recipe, torte. Bookmark the permalink.